I’m all about convenience in the kitchen and if I don’t have to make it from scratch, I sure won’t. I love to cook, but sometimes it becomes a chore around here and I feel like I spend all day in the kitchen sometimes. 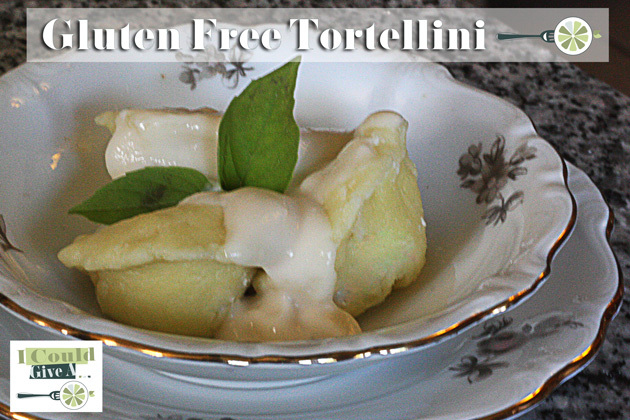 I also love to eat and since I can’t just run to Kroger and get gluten free tortellini, I decided to try my hand at making my own. Now, normally, I am a perfectionist in the kitchen, and I get down when a recipe fails, but I’m also not an expert at this past making stuff and it occurred to me that maybe my readers aren’t either. Looks aren’t everything, taste is, but I’m not going to lie here: I need a pasta roller for my KitchenAid. Maybe Santa will be good to me, but until then, I’m gonna keep on keepin’ on and enjoy me some cheesy tortellini, I ain’t hatin’! The recipe was awesome, but I just didn’t have the muscle to get my pasta rolled thin enough and I even enlisted my husband for the job since my back wouldn’t let me climb on top of my island and run a steam roller over it. Actually, I was quite disappointed because of the thickness and wasn’t going to blog about this recipe fail at all, until everyone tried it and absolutely RAVED about it. I have to admit – it was really good and even the thickness wasn’t a problem because I filled them right up until they almost busted open! So, I got some thick tortellini and not the thin and perfect kind I get at the store, but who cares? I’m not an Italian chef and I have to give it up to those who pioneered this pasta stuff without a fancy roller because it’s hard to get this stuff thin with just a rolling pin. At least, it was for a 45 year old with physical limitations, but you might get it paper thin and perfectly beautiful! I want yours to be beautiful, and if it is – please come back back and post some pics so I can drool over them, ok? Sharing is caring! 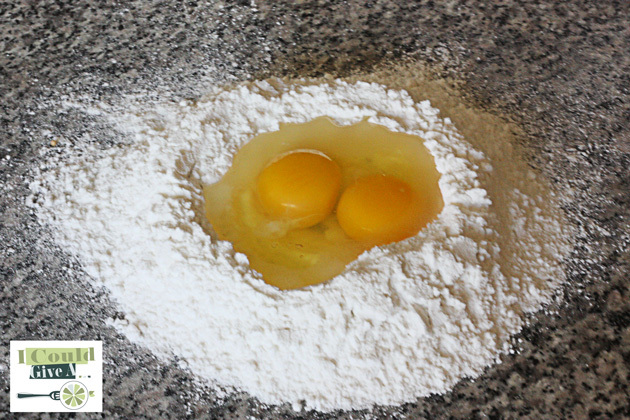 I started with a mound of flour and made a well for some eggs. Honestly, I don’t even know how much flour I used, but the key here is to put the eggs in the middle. I used 2 eggs, but if you have more flour you can just add another egg. 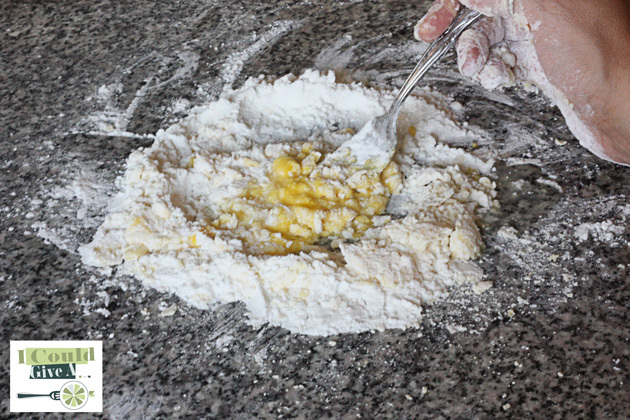 First I used a fork to start mixing and just used it to add a little of the flour from the sides as I went. Patience is key here. Looks messy and it is but just keep mixing and you’ll get there – I promise! Believe it or not – it will form dough but if you need more flour, add it gently in small amounts because adding another egg at this point would be harder to get great results (trial and error here – I know because I tried it) and you don’t want to try to add a heap of flour to fix it – my first try I was very disappointed. I used my gluten free flour here and didn’t really have a problem at all, which kind of surprised me. One of the things I had read on the internet is that pasta dough needs a good kneading to ensure that it’s smooth, even and cooks up light so I went to town here. Since gf flour is missing the stretch that wheat flour has, you just have to keep kneading and if you do it for about 4 minutes or so, the dough comes out really smooth. Actually, it was a lot smoother than expected and cooked up really light and I honestly found it comparable to gluten free pasta purchased at the store. No lie. It was really nice. This is as thin as we could get it with a roller, but hey, it tasted great and that’s all that really matters, isn’t it? I made 3 balls of dough, and let it rest for about 30 minutes before I started rolling it out but I didn’t refrigerate it because I didn’t want it stiff like cookie dough – I covered it in plastic wrap too to prevent it from drying out like an old shoe. Good call too, because although it was very pliable and rolled easily, I couldn’t get it thin enough by hand. I really need a pasta roller Santa! 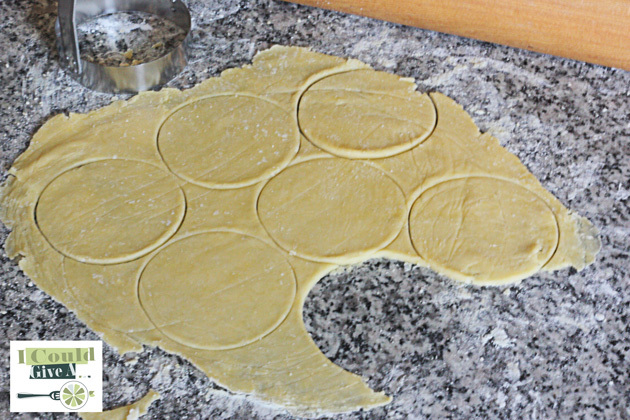 I used my biscuit cutter here and cut out circles and used the scraps as I went along, remixing with the dough. 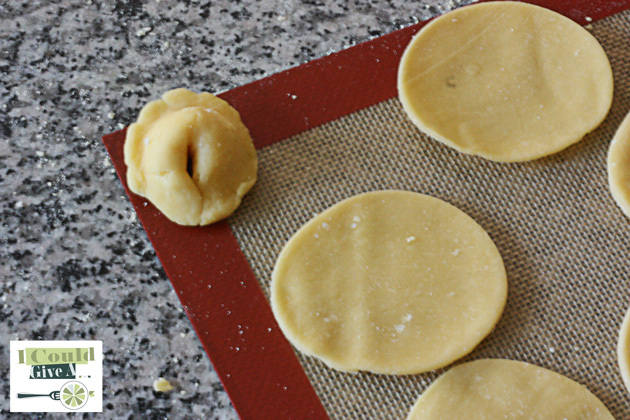 I always put parchment paper over my dough when I use my rolling pin because it helps to keep it from sticking to it, and I used a dough scraper to get my little rounds onto my baking sheet. I used an egg wash of 1 egg and about a tablespoon of water and brushed it on half of the circles and put about 1/2 a scoop of the filling in the middle and folded them over to seal. I also used the egg wash to put the points together and although my dough was a little thick, I still think they turned out so cute! Isn’t my tortelloni so cute? That’s the word for a large tortellini. Makes sense, since anything small is an ini of some kind! The next thing I did was pop my non stick baking mat onto a cookie sheet and popped them in the freezer for about a half an hour – my big freezer. If you are using your freezer on your fridge, make it about an hour. You want to freeze them separately so that they hold their shape when cooking and don’t stick together. If you have made gf pasta already, you know that you have to stir it because it tries to stick together and I always have to cook it for just a few more minutes than called for on the box because it’s too chewy for my taste. Get some water boiling and put them in, I used my little mesh spoon to gently lay them into the water. I boiled them until they floated to the top, although I did add about another minute because I was afraid of that chewiness again. I got me a jar of some gf Alfredo sauce, some fresh basil from my garden and fed it to the family and guess what? They LOVED it! I got so many compliments that it made what I thought a failure, a delicious meal that we all enjoyed together. And THAT is what was most important. …but I still need a pasta roller.